The Big Apple is an extra wide tyre, designed for comfort and speed with Schwalbe quality, and a puncture resistant layer. 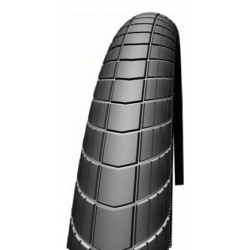 Because the tyre is wide, it rolls easily, especially on less than perfect surfaces and with lower tyre pressure. These tyres are wider than many other tyres. Before buying, making sure that you have adequate clearance on your bicycle. Example weights: 50-406: 535 g, 55-559: 770 g.
Note that Brown and Cream versions have a lesser type of puncture resistance, "Kevlarguard" in place of "Raceguard" - hence the lower price.